The pioneer of amazing attacks and brilliant sacrifices, Adolf Anderssen was the most successful European tournament player in the mid-1800s. Famous for his crazy tactical games, particularly the “Immortal Game” and “Evergreen Game”, he astonished spectators and opponent’s with seemingly impossible attacks that always ended the game beautifully. Despite playing at a time when Paul Morphy was on the rise, Anderssen continued to be one of the most feared players of his generation. 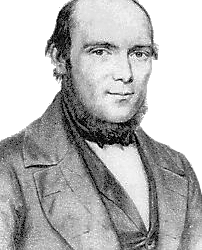 Adolf Anderssen had a late start in chess, not becoming a well-known player until the late-1840s. At that time was invited to play in the first international chess tournament which was going to be held in 1851. In order to prepare for this tournament, Anderssen played more than 100 games against strong opposition and this greatly increased his playing strength. He ended up winning the 1851 International Tournament and was then recognized as the strongest chess player in the world. After this tournament, Anderssen continued to crush the majority of tournaments he played in Europe. His main weakness was in matches against one specific player, but this didn’t keep him from continuing to be one of the best players of his time. Anderssen passed away on March 13, 1879.